Smart cameras will help you with your business. Keep everything under control with Axis smart IP cameras. They are connected to the Internet and immediately store data in cloud storage. Thanks to this, you can connect to the system from anywhere, anytime. Perfect overview – always and everywhere! 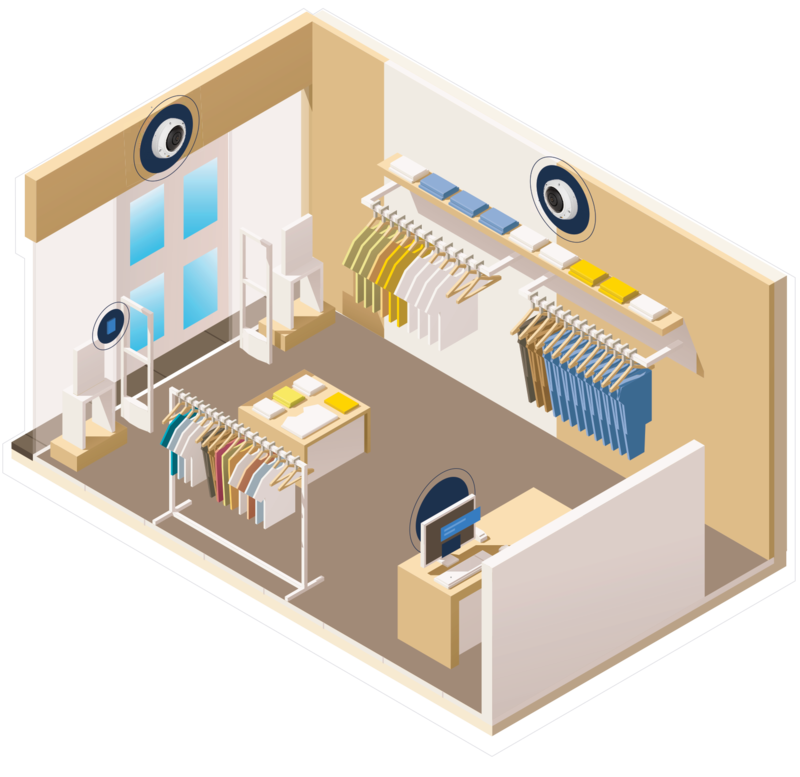 IP cameras are constantly monitoring retail outlets and can detect suspicious situations at the same time. When they detect such a situation, it alerts you via e-mail or Push notifications to your mobile phone. Surveillance cameras can enable high-quality recording in these situations, locking the door, or triggering an alarm and a host of other automated actions. Finding and playing back a record of these critical events is then quick and easy. Traffic statistics combined with cash register data simply show you how many shop visitors your customers really have. With camera data, you can check the effectiveness of your marketing and planned shifts based on actual traffic information. Smart search works great in linking with your other systems in records. For example, you can view customer behavior when handling a specific product, look at records of critical cash register operations such as claims or returns. Cameras can also track the actual length of a queue. If the number of people in the queue exceeds the set length, the system sends a notification and you can open another cash register. Comfort for your customers – our customer, our master. We offer a number of accessories to make life even easier. For example, you can use sensors to check when the staff opens and closes the shop. Or track the temperature of key locations, such as freezers, or have a photo of the showcase sent every day. Combined with the event module, you can have a photo every day, for example, in the morning, how the goods were displayed during the day and how they were cleared from the counter in the evening. For maximum control and feeling of security. All of this is offered by NetRex AddOns. With its possible capabilities, the NetRex System is available from any device. You can connect from your computer, tablet, and mobile device to keep your stores under control while traveling. Effective control from anywhere – from home, work, and from abroad. We will design the best solution for you, install it and train your employees. Our technical support will ensure that the operation does not fail and we will help you with fulfilling GDPR and other legislative conditions. We have more than 12 years of experience in this area, and we are currently monitoring more than 1,500 of our clients’ shops and buildings. Rely on professionals!